I’m four episodes in to the first season of the newest Star Trek show … and I’m really, really enjoying it. I’m going to keep this spoiler-free, so it will probably be somewhat short! The production value is on par with the recent movies; the special effects, the costumes, the work they put in to making the show look good is incredible. The look and feel of the show is the best any Trek show has ever achieved and definitely equal or better than anything else I’ve seen on TV. As far as the characters go, they’re growing on me fast. Initially it was a little strange seeing a crew I knew nothing about and had no emotional connection to, but that by the end of the two part premiere, I was hooked and curious to see where they would go with them. Over the course of the first four episodes they have done a great job of planting a lot of seeds and mysteries that I am curious to see play out in the seasons to come. I will say that I am still getting used to the idea that the lead character is not the captain … but I think it’s a strong idea. The franchise has been around for more than fifty years; they have to play with the format to find new ways to approach Star Trek story telling. Regarding the Discovery itself, I love the look of the ship more than I expected to. It’s actually a throwback to discarded design ideas developed in the 70’s when they were first thinking of bringing back Star Trek (see the image below for an example). At first I thought that was a weird decision, but the end result does a great job of blending that design style with current ideas. My one complaint, and perhaps my nerdiest comment … I wish the show was set in the Kelvin Universe, not the Prime Universe. That would easily explain the design similarities to the new movies, the technological advances (in response to Nero’s arrival two decades before). It would also open the door for them to go anywhere with the story telling with no concern about contradicting the more than 700 episodes of Star Trek already out there – their only concern would be staying in line with (currently) three movies. However, I get it; the movie arm and the television arm of Star Trek are separate entities, and those separate companies (Paramount and CBS, respectively) most likely have some sort of legal concerns about overlapping with one another. But it would make continuity a far simpler affair. That aside, I’m really enjoying the show and am excited to see where it goes! I’ve been holding off on blogging my reactions to the new film to give people time to see it before I post spoilers … but fear not, my thoughts are on their way (whether you want them or not!). Well, calling me excited for May 17th is an understatement! This thing literally gave me chills. Very, very excited! And check out the bonus few seconds at the end of the Japanese version of the trailer … very similar to the ending of Wrath of Khan – is it an homage, something to fool us, or a hint at where this one is going? Brace yourselves. I’m going to be amping up my nerd levels in the coming months. Star Trek: TNG in theaters! It’s like Gene Roddenberry planned my birthday! Or two days after it, anyway. In honor of Star Trek: The Next Generation’s 25th anniversary, on July 23rd they’ll be showing two remastered episodes in theaters across America (including the one down the street!). I’m actually really, really looking forward to it – I think it will be a blast to be in room with a bunch of other fans seeing these classics on the big screen! You can get more info here about the event and what cities it’s showing in. I knew Star Trek could be real! According to an engineer, we could build the Enterprise in 20 years for a trillion dollars. Sounds like money well spent to me! Read the whole article here. He created a website detailing how it would all be able to work here. What do I have to do to be a crew member? 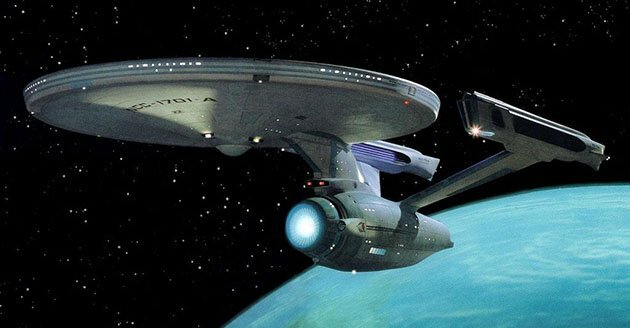 The estimated cost of building the Enterprise: about $50 billion a year for the next 20 years — $1 trillion in total. That sounds like a lot of money (because it is), but considering that the United States spent nearly that much on the controversial Troubled Asset Relief Program (TARP) to bail out banks in 2008, putting a trillion towards making Star Trek a reality suddenly doesn’t seem as ludicrous. Yeah, it’s still pretty ludicrous, but in a reallycool way. Yes, it’s ridiculous. Yes, I want it. I never knew how empty my life was without a Star Trek Enterprise plush. But now that I know they exist … it’s all I can think about. If you squeeze it, the engines light up. Seriously. It’s a light up plush Enterprise I can cuddle with while I sleep. That’s awesome. It can also fit in my bag when I go on retreats and mission trips. It could boldly go wherever I go.